11" x 14" 16" x 20" 18" x 24" 22" x 28" 24" x 36"
Magnets seal the two lenses of the 8.5x11 frame together. 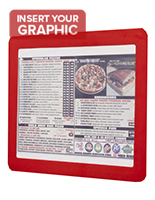 Double sided design of 8.5x11 frame enables display to be seen from multiple directions. Black border highlights your picture. Lightweight plastic construction allows for easy installation. 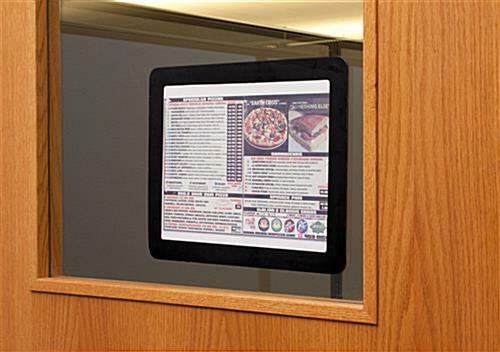 This 8.5x11 frame that mounts to a window has an enclosure that secures a picture in place, yet users are able to change postings easily. Only one hand is need to replace a poster, by simply separating the two sides of the display. The magnetic 8.5x11 frame's glue dots allow for adhesion to a flat surface. 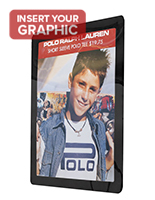 This versatile advertising display can be mounted either vertically or horizontally. 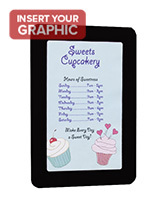 Placing paper or art into this 8.5x11 frame is even faster than using tape to hang your signs. 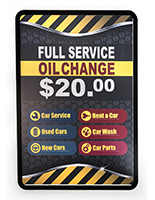 These advertising holders are especially good for use on doors, in windows and other heavy traffic areas. The black border of this 8.5x11 frame with adhesive dots ensures displayed art will stand out. This border is the perfect accent for almost any image. The 8.5x11 frame is sure to match with most environments. 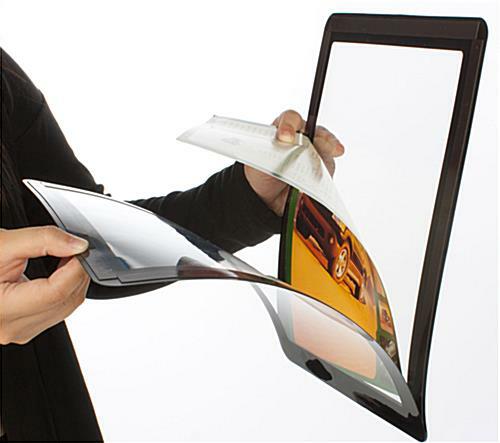 The rounded edges give the picture holder a modern look. The 8.5x11 frame that is designed for glass door mount use is extremely thin and its low profile makes each unit less likely to be knocked off a wall. 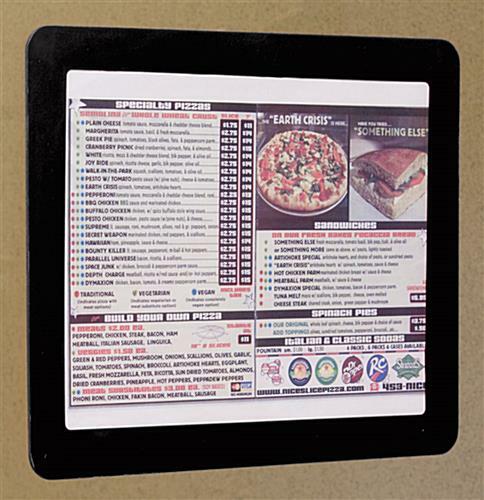 The light weight of this picture display makes this item a great option for mounting pictures onto a door. 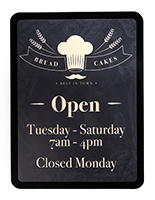 This 8.5x11 frame, also known as a door sign holder, is perfect for displaying menus at a restaurant. 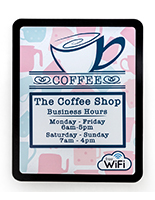 Shop owners will find these items useful for displaying an advertising poster or other POS functions. Paper can be changed out of this 8.5x11 frame that mounts to a store window, again and again without the unit ever having to be taken down from the place it is attached to. 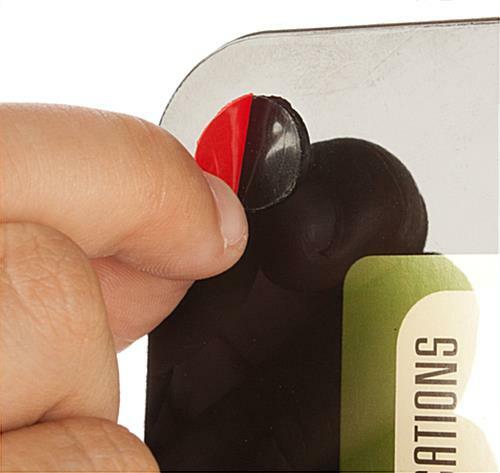 Please Note: The adhesive dots on the back of this display are designed for a one-time use. However, customers can easily remove the dots and replace with new dots, which can be purchased at your local craft or office supply shop. Over time, when this unit is placed in heavy lighting or being outside in the sun it can result in a blue tint. 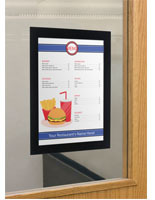 These little frames are perfect for posting required health department signs in our school cafeterias (such as health permits and inspections.) I have ordered hundreds of these over the last couple of years. They are neat, tidy and affordable, plus easy to change out several times per year. The ONLY complaint I have is that they need more sticky stuff to stay on the wall or window. I supplement with two-sided tape. Thanks for the great review and for your continued business, Amy! We'll certainly pass on your feedback to our product designers! These magnetic frames work great for my company! Most of our signs are in a kitchen area where it is high traffic and a mess. These frames help to protect our sheets but still make it easy to access them when they need to be replaced! We're so happy to hear this, Maureen! Thanks for a great review. We use these on windows and on walls to post our policies and procedures. They really add a clean, professional, and intentional look. These are just perfect. There is always something that needs to be communicated to another department, to customers, to vendors... These sign holders display messages, printed on 8x11 printer paper, beautifully and professionally. No more tattered edges or curled ends!!! I purchased 5 of these on my first order but after receiving requests from employees from other locations, have since purchased over 30 window sign holders!! These will not disappoint! Wow! We're so glad to hear these work so well for your company, Lea! Thanks so much for shopping with us. Ordering is super easy and shipping is very fast. Product was just what we were looking for and we could not find them anywhere else. Great to do business with.